There have been uneasy calm and confusion in APGA camp since the divine revealation of Willi Obiano's double standard with respect to voters card registration. We have been religiously following the events and shall in due cause reveal more about this scandal. We have also been watching very carefully every move and steps taken by the prior mentioned actors in this game of shame. We want to warn that they all should desist from their desperate attempts to alter the records and impede on the wheel of justice. Meanwhile, we have read and carefully understudy the undelying lmisinformtion from the DG of the Willi Obiano Campaign orgainsation decribing this revelation as a mere 'speculative internet rumor'. His role as the DG accords him that basic responsibility to react against (and not for) such a revelation,so this is understandable. Also, we do not expect Prof. Onukogu the INEC Anambra state Commissioner to accept any knowledge of such scandal even when he may have been a part in the whole process of the deal. The recods are there and would be made public in due cause. Matter of factly, however,a clear and non deletable record of Willie Obiano double registeration both at Lagos and Anambra. State still exist. What variables remain constant when a voter's Record is transfered from one location to another? Does the transfer of record from lagos to Anambra affect the Vin Number? Does the transfer of Voters record affect the Date of Registeration of the Voter? We know without doubt that the essence of voters register transfer is to among others things enable the voter carry out his/her electoral duties at the new place of domicile. We also know that as at the time of Political Parties screening (APGA inclusive) that voter register update has not resumed in Anambra State. Which voter card did Willi Obiano present during the APGA screening Panel in Auguts 16, 2103? Has he succesfully transfered his voters record from Lagos to Anambra before then? Why was Obazie disqualifed from participating in the primaries? Our available records show that Willie Obiano's Anambra record was issued to him on Sept 3 2013 as against the Lagos registeration of 2010 with the following VIN number 90fb***************332. That he did his registeration at Ramot Oluwakemi Seinab street, Ifako Soluyi Ward in Kosefo LGA of Lagos State. We have noted the differences in the Voters VIN Number. We await INEC to answer our question on the variables that change when a voters record is transfered from One location to another. We are constrained from publishing the full details of the two Voters record in our possesion until we conclude all our inquires and clear grey areas, However, we carefully chose to reveal some part of the information so that Uzodike and Obiano himself will know that this is not an 'internet rumor' as they presupposes. We frown at Guardian Newspaper's mere call to Prof Onukogu and their subsequent acceptance of his outright denial, a thorough investigative jouranlism is expected from them and other media Houses. We therefore challenge all the political parties, Human rights bodies and the Press to use the provisions of the Freedom of Information Act to obtain the records both from INEC (Lagos and Anambra) and APGA to present the Voters Information that Willie Obiano presented during the screening excercise . We are amused at further desperate moves by Peter Obi to alter or delete this record, this we know is an effort in futility. Consequently, we call on the Lagos State Government to cautiously monitor the IT department of LASIEC against inflitration. 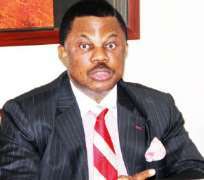 Obvioulsy, it is foolhardy for APGA and Mr Peter Obi to continue to parade a man who has violated an Electoral Act –a criminal offence as their candidate instead of shopping for a new candidate because no matter how long they try to delay the cause of Justice, Mr Willie Obiano must defintely face the wrath of the Law. Let them not be like the proverbial fly that follows the smell of the corpse to the grave. Finally, we call on Ndi Anambra and all supporters to take this revealation seriously and make very wise use of their vote.